Many people in Côte Saint-Luc have heard about the ongoing campaign to save the Meadowbrook Golf Course from development and have it converted into a green space. Many have the impression that it is protected and that the work is over. On Thursday, May 11 (7 pm) Les Amis du Parc Meadowbrook will hold an information meeting at St. Richard’s Parish in CSL (7070 Guelph Avenue, near Parkhaven) to update the public on the current status of the green space and to secure additional help to have the area converted into a regional nature park for the over 150,000 residents who live in the West End. The meeting will feature several speakers and provide information on the green space and how it can be used by residents year-round for a variety of activities. There will be a special presentation on the many legal environmental battles in Montreal and a new legal defense organization, the Legacy Fund for the Environment. For more information on Les Amis du Parc Meadowbrook, go towww.lesamisdemeadowbrook.org, SOS Meadowbrook on Facebook or @Parc Meadowbrook on Twitter. Chalk up another impressive initiative for our city and the Eleanor London Côte Saint-Luc Public Library. On Sunday, June 8 we inaugurated the CSL Library Demonstration Garden and at the same time held our Second Annual Great Tomato Plant Giveaway. The newly constructed demonstration garden is located behind the library. Mayor Anthony Housefather and members of council were on hand for the official ribbon cutting ceremony. A representative from the TD Friends of the Environment Foundation was on hand to present a $2,250 grant for the project to our amazing librarian and new grandmother Janine West. Receiving a cheque from the TD Bank. Young Matthew Erdelyi helps with the ribbon cutting. As the councillor responsible for the library, I am very proud of this initiative. Plants were distributed to the first 400 residents to visit the Demonstration Garden (one plant per household and proof of CSL residency required). Residents were able to sign up for gardening classes offered at the library, a space at the community gardens, learn about the seed library and take a tour of the demonstration garden. Kid-friendly activities were also planned. Lining up for free plants. A new City of Côte Saint-Luc by-law (2302) obliges apartment owners to offer recycling services to residents and consolidates rules about recycling, hazardous waste, organic waste and other types into one simplified by-law. The collection days are not changing. However, the new collection times for garbage collection, recycling collection and organic waste collection is 7am to 7pm. If waste is placed in a rigid, tightly-covered receptacle (brown bin, blue bin or covered garbage can—not plastic bags) then residents can put it on the curb starting at 10pm the night before. The by-law includes provisions to fine, however the city wants to first educate and encourage residents to sort their waste. Residents must place their recyclables into the covered blue bins being delivered this spring. Leaves and other garden waste must be placed in brown bins, paper bags or certified compostable bags. The organic-waste-collection trucks will not collect organic waste in plastic bags and the garbage trucks will not collect garden waste. Household hazardous waste and household appliances—such as paint cans, batteries, televisions and so on—will not be collected and must be dropped off at the Public Works yard depot. Bulky waste (such as couches and mattresses) and construction waste will not be collected in the regular garbage collection, however residents can call the city to arrange a collection for a fee or use of the private bulk waste collection companies. The city has the authority to reduce or suspend collection of garbage, recycling or organic waste if the resident—after repeated warnings—does not sort items correctly. Apartment/condominium owners are obliged to offer recycling collection services to its residents. Commercial establishments and institutions must begin recycling by March 2010. The by-law to regulate the collection and disposal of waste materials (By-law 2302) was passed unanimously by the city council at the March 16, 2009 meeting. A copy of the by-law is available at the Archives counter of city hall (5801 Cavendish Blvd.) or at www.CoteSaintLuc.org/en/Bylaws. While there is no sign of any plans to build homes on Meadowbrook Golf Course, greenspace activists in Côte Saint-Luc and Montreal West continually keep everyone aware of the fact that one day the owners of the land could try to close the links in favor of development. 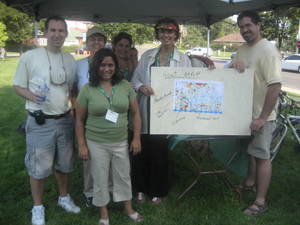 On August 23 they held an event at Richard Schwartz Park they called Meadow Fest. There was live music, information kiosks, some vendor tables and lots of community spirit. I must say that I was disappointed with the turnout. It was a gorgeous day and there was plenty of publicity, yet the gathering was sparse. I really do no think that the future of Meadowbrook is truly on the radar screen of most residents. In the photo Councillor Dida Berku and I shared a moment with some of the event organizers, with Dida holding up a map of the golf course. I attended an open house August 20 at city hall where we unveiled our curbside organic waste collection program, which starts in mid-October with all 4,798 single-family homes and duplexes. Since townhouses, high rise condominiums and apartment buildings will not be part of this first phase of the program, the only District 2 residents to be affected by this will be those on Ilan Ramon Crescent. Beginnng October 20 Ilan Ramon homeowners will have their garbage picked up on Mondays and organic waste on Thursdays. Recycling pickup will remain on Tuesdays. I wish to give credit to Councillors Steven Erdelyi and Dida Berku, along with our staff in Public Works, for spearheading this project, which was launched a year ago in 500 homes. Instead of separating garbage two ways (recycling and garbage), participants will now separate it three ways (recycling, garbage, and organic waste) and will receive a new brown bin container and small kitchen collector. Diverting organic waste to compost facilities (and paper, plastic, glass and aluminum to recycling plants) will save Côte Saint-Luc money as dumping garbage becomes most costly. We had a good turnout at the meeting. I can say that most of the town houses, condos and apartment buildings in District 2 are already on board in terms of recycling. And they will become part of the organic waste collection in due time. The annual household hazardous waste collection takes place in Côte Saint-Luc on Sunday, August 17 from 9am to 5pm beside the Public Works building at 7001 Mackle Rd. Common hazardous items include fluorescent light bulbs (including compact florescent lights), batteries, paint and solvents, pesticides, cleaning products, aerosol cans, motor oil, gasoline, expired medication, thermometers, used computers and electronic equipment and empty propane tanks. At last year’s event, we collected a record 6.5 tonnes of household hazardous wasteé Since taking office in 2006, our city council has introduced recycling in more than 90 percent of apartment buildings, launched an organic waste collection pilot project, switched to low-sulphur diesel fuel in our vehicle fleet, adopted an anti-idling bylaw, created a permanent electronic waste depot and more. We are moving the city in the right direction on many eco-friendly fronts and we ask residents to do their part too. Residents should not mix different household hazardous materials. Please follow any instructions for use and disposal provided on product labels, and when possible, bring items tightly sealed in original containers without removing the labels. Place any container that cannot be tightly closed in a sealed plastic bag. Used electronic equipment will also be accepted during the collection. If you can not attend this collection day, you can drop off hazardous waste at any of Montreal’s Eco-centres. For more information visit the City of Montreal’s website, www.ville.montreal.qc.ca or call 514-872-3517. Residents can also dispose of regular batteries and rechargeable batteries at the Public Works building (7001 Mackle Rd. ), weekdays from 8am to 4pm, or at other municipal buildings shortly.